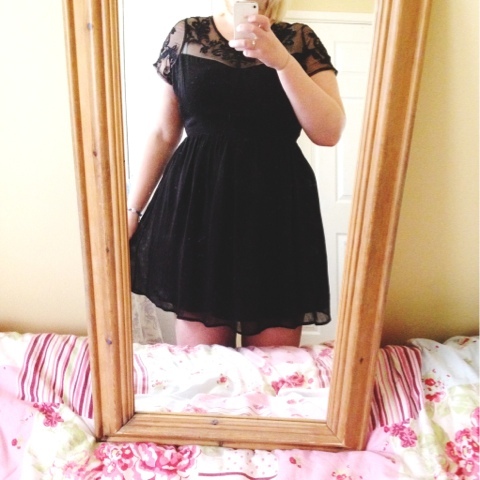 Home Unlabelled Pretty Birthday Dress. When I was in Truro over the weekend I wanted to see if I could find a cute dress to wear for my birthday next week, I didn't see anything I really liked until I looked across the road and saw a pretty little boutique which I hadn't heard of before. I decided I would have a browse around the boutique to see if I could find anything to flatter my figure. The more I looked the more I fell in love with the shop, not only was it full of pretty dresses but they sell the most gorgeous bags all at brilliant prices too. The shop I went in also has an online store so do not fear ladies it's called preloved boutique, you can find it in Truro down Kenwyn road or check their fb or shop link out, I will pop the links below for you. 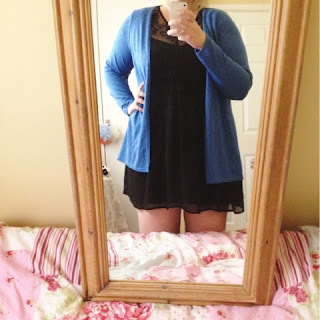 I eventually came across a blue cardigan which I knew straight away that I needed, it was originally from next so I got it at a very good price (£8.99), I wasn't sure what kind of dress I wanted to get as I wanted it to match the blue cardigan but I finally found the perfect dress! It's black and a brown colour with mesh leaves and cleavage, it goes perfectly in at the waist and ties around at the back. This dress is originally from new look so the original price was £22.99 but the boutique were selling it for £9.99 which I thought was amazing! So now I have a pretty dress and cardigan to wear for next week! They both for me well and the blue suits me for once (I normally suit green rather than blue) now all I have to do is decide which shoes do I wear with them.